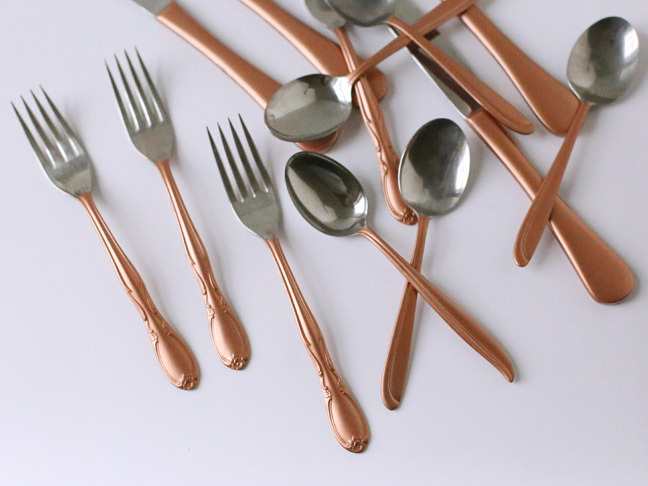 I threw a big party last month that posed a dilemma: I didn’t want to use disposable flatware, but I also didn’t want to spend a ton of money on a few sets of new flatware that I’ll rarely. When I hit the thrift store, there are always bins of flatware for sale, but the mismatched look isn’t really my style. 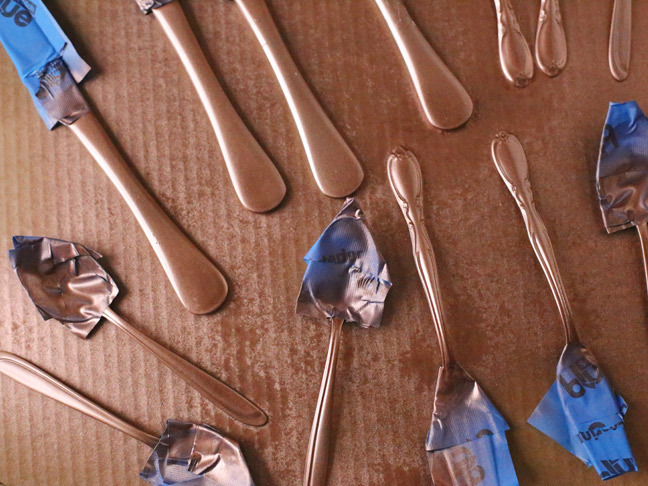 I ended up spray painting the handles in a trendy copper color to make it all cohesive—and the results were stunning. This is one of the easiest DIY projects in history! It requires all of about three supplies, and won’t take you more than an hour to execute. 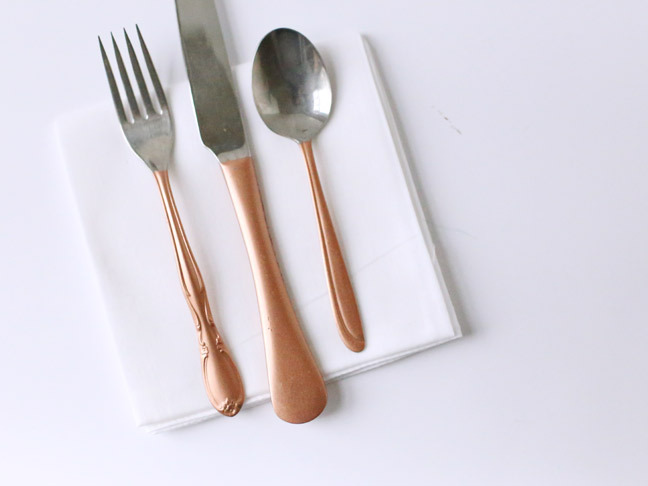 This DIY copper gilded flatware, is super on-trend right now, and you can easily customize this project with your preferred metal finish. Make it copper, make it silver, make it gold. Just make it shiny! What I love about the finished product is that you have something that really dresses up a dinner-party place setting without requiring you to make a big investment. 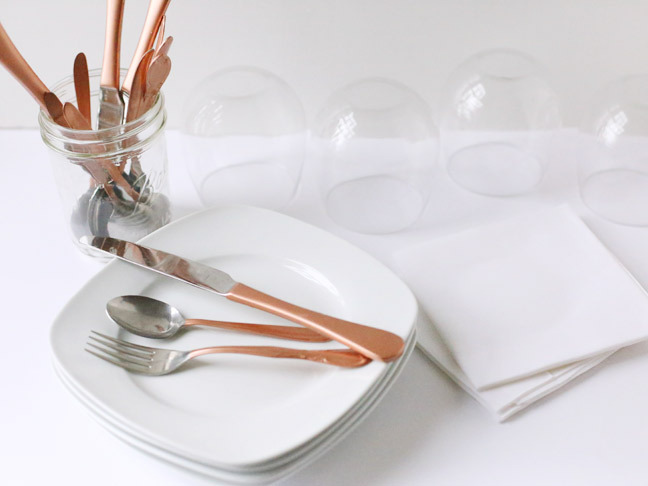 Bust out your everyday dinnerware, basic white dinner napkins, and wine glasses, and your new forks, spoons, and knives will steal with the show while effortlessly giving you a really elegant look. 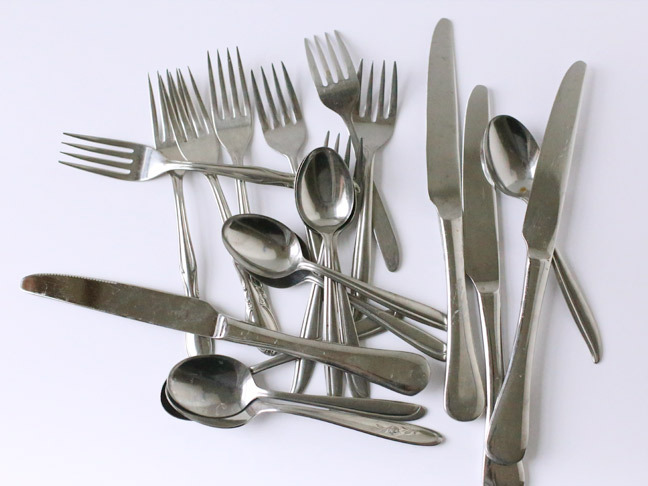 I’m working with thrift store flatware here! 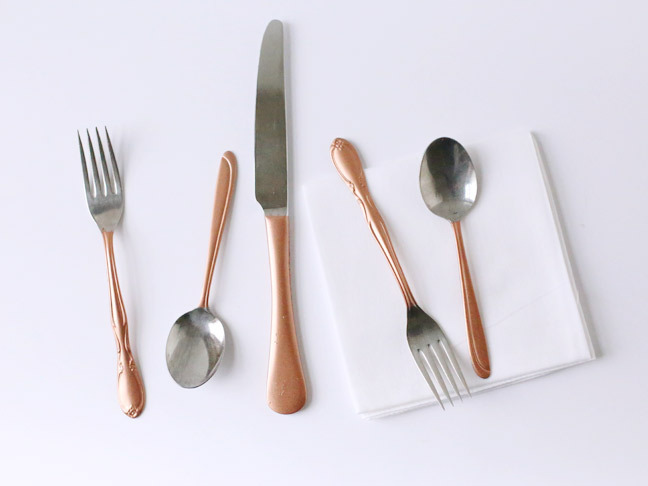 Or flatware you still have hanging around from your old college apartment. Or stuff you keep stashed away for camping trips. Or the mismatched stuff being sold for pennies at neighborhood yard sales. Whatever it is, it will work and it will be beautiful! 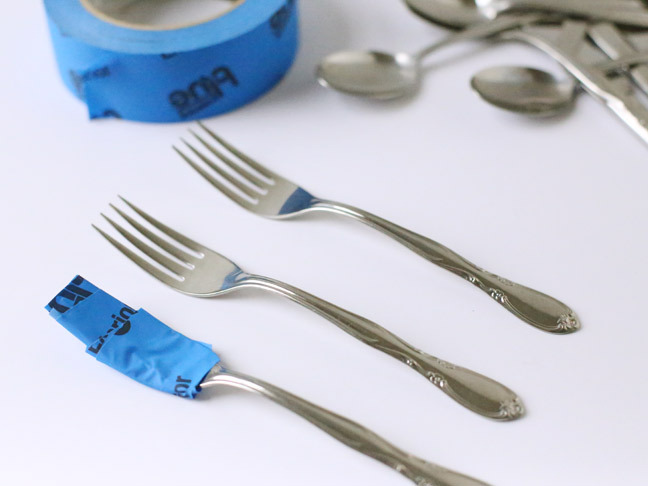 Step 1: Begin by taping off all of your flatware with painter’s tape. You’ll want to leave just the handles exposed. Make sure you have a nice secure seal so that no paint ends up on the end you eat from. 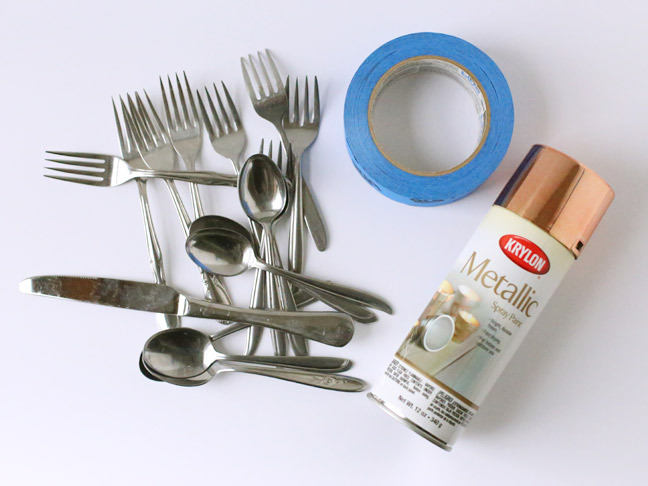 Step 2: Place your taped flatware on a protected surface, and give the first side two to three light, even coats of spray paint, allowing fifteen minutes or so between coats. Then flip, repeat on the second side, and allow to dry. 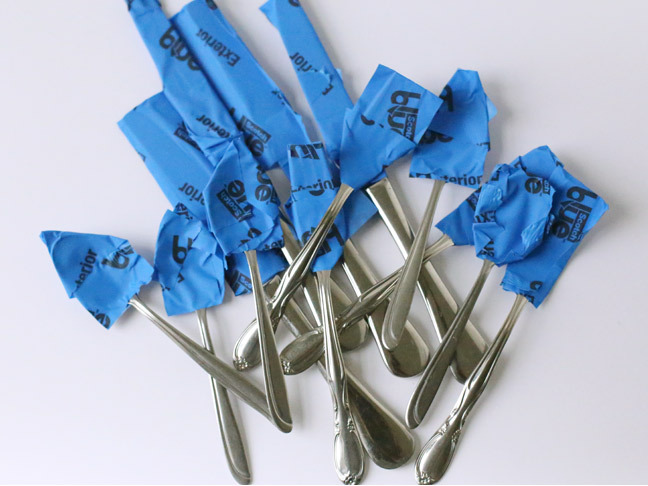 Step 3: Once the paint is completely dry, carefully peel off the tape and you’re all done! 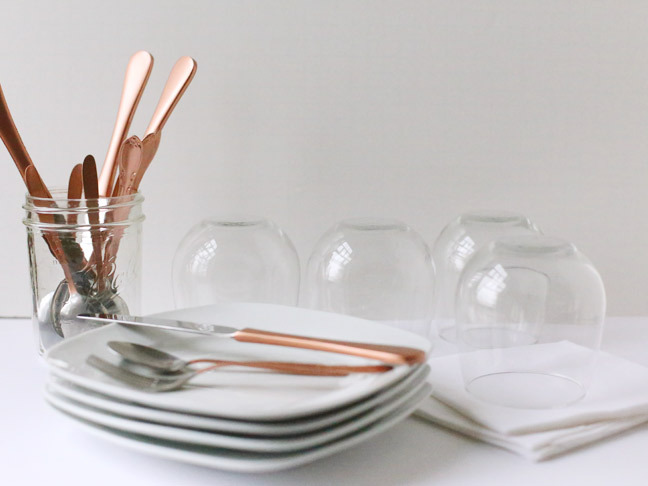 Keep in mind that your new glammed out flatware will not be dishwasher safe. Your best bet is to hand wash, being sure not to scrub excessively on the painted parts.